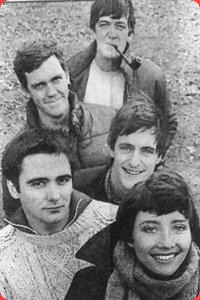 This Cambridge Footlights dream team numbered talent whose work has ranged from Blackadder to the Harry Potter films. Fry and Laurie enjoyed a successful sketch partnership before both pursued fruitful solo projects with Laurie now a star in the US with House and Fry ubiquitous with credits too numerous to detail. Thompson has enjoyed a regular and high profile film career. Paul Shearer is best known for his work on The Fast Show, Tony Slattery has since made a steady stream of appearances since from films such as The Crying Game and Peter's Friends to TV shows like Ready, Steady Cook and the late Penny Dwyer who chose a career in metallurgy over one in entertainment and worked on the construction of the Channel Tunnel.